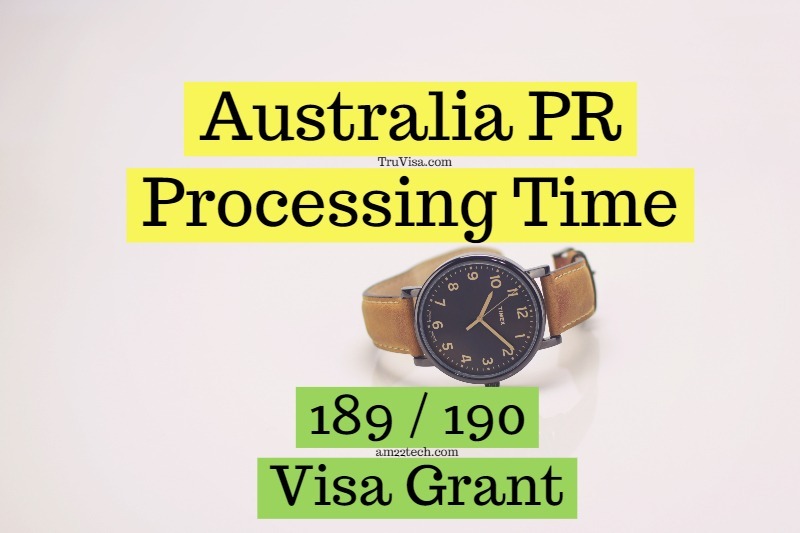 189 Skilled – Independent Points-tested visa is taking 3 to 11 months to receive PR grant after you have submitted your application. You will either get a CO (case officer) contact query within 3 months or get a PR grant at the end of 3 months after you lodged your 189 invitation. Once you get a CO contact, your application will be on hold until you submit the requested documents. Once documents are uploaded, your application is re-submitted at the front of the queue and can take another 3 months to receive final ‘GRANT’ of 189 Visa. 190 Skilled – State nominated points-tested visa is taking 2.5 to 8 months to receive PR grant after you have submitted your application. You will either get a CO (case officer) contact query within 2.5 months or get a PR grant at the end of 2.5 months after you lodged your 189 invitation. Once you get a CO contact, your application will be on hold until you submit the requested documents. 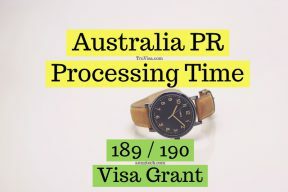 Once documents are uploaded, your application is re-submitted at the front of the queue and can take another 2.5 months to receive final ‘GRANT’ of 190 Visa. The processing time mentioned above is only for applications that have been submitted after receiving the SkillSelect EOI ‘invitation to apply‘. Invitation to apply is currently given to people, with a monthly draw (lottery), with the highest points in their job occupation category. The waiting time to get an invitation could vary from 1 month to up to 12 months at this time for some occupations. Example, Software Engineer with 70 points can expect to wait more than 6 months to receive 189 visa invite. You cannot apply for Australia Permanent residency (PR) until you receive a formal invitation. You can expect an invite for 271311 with 75 points in 1-2 months. Chances are low for 70 points at this time. Thank you for this. I am very confused. When I submitted my EOI for Visa 190, I had 30 points for age, 20 points for Superior English, 15 for Masters in law and 5 points for studying the masters in NSW. That totals 70 points. However, shortly after I submitted the EOI, I received an extra 5 points for ‘State Nomination’ (NSW), which gave me a total of 75 points. Is getting those extra 5 points because of ‘state nomination’ normal? I did not select anything when populating the EOI that could give me those points except that I selected NSW as the state that I would like to receive a nomination from. You are deleting your posts yourself. I have not done anything. I can’t answer if you keep deleting the posts. It is better you ask more questions on our forum. Hi, i received invitation under 189 for External Auditor with 85 points last September. CO contacts for additional information in November and response was provided by mid if December 2018. Further, i updated the application with change in circumstances with details of my newborn in February 2019. Additional documents were requested by CO for newborn which was furnished mid of March 2019. Immi account is updated with newborns name and hap id is created, i have even submitted the medical details and it says no action required. My query is from here how long should it take for Visa Grant? Processing times to the best of my knowledge and analysis are given above. Please read. Hello, Sir, i got a invite in 190 from new south wales today can you tell me how much time it will take to get final PR Grant (occupation is computer network) my points are 80 in 190. I have given times based on what i have seen and heard people getting grants from various groups and forums that i am part of. It is upto you to believe it or not. Okay Sir, Thank you for your instant Reply. I submitted my EOI on Feb 15th 2019 with 70 points for 189 and 175 for 190 (VIC State). Can you please let me know how soon should I expect to receive an invitation. I filled application for Software Engineer – ANZSCO 261313. Chances of invite with 70 points are low at this time for 261313. You should try to increase your points to 75 to have any realistic chance of invite going forward. Thank you for your response. Based on your experience, what are my chances for 190- State Victoria. I have put my application for 189 visa for ANZSCO 233999- Engineering Professional nec this month 11th April at 75 points. What should be the expected waiting time keeping in mind the new slashes in number of 189 visas. Is it going to increase the overall delays. At this time, the wait is about 6 months for job code 233999 with 75 points. new 189 visa reduced quota is implemented. Then on 18th jan 2019we uploaded PCC of uk for my partner which our agent asked , Australian pcc was already uploaded in dec , still haven’t got CO assigned , what do u think the processing time will be ? Please read the above article for processing timing. 1. Assuming I take more than 12 months of gap (outside Australia) and then enter again in Dec 2020 – I will disqualify for Citizenship, right (as I will not satisfy the criteria for staying not more than 12 months)? 2. If I disqualify to apply for Citizenship – can I renew my PR and then show that I lived in Australia from Dec 2020 to Dec 2024 to be able to apply for Citizenship? Are there any issues to renew PR (other than applying for Return Visa if I have to travel outside)? As we do not have a clarity on H4 EAD yet – I want to wait and stay in the US until end of next year hoping that there will be confirmed news whether EAD will be retained or terminated and if terminated I want to enter Australia by Dec 2020. May I request your inputs? Your question about Australia Citizenship after PR 5 years is out of scope of this article. hence, it has been added to our forum and answered there. Congrats on your visa grant! I have also applied for Visa 189 and submitted the application post EOI in Dec 2018. CO assigned in Feb and asked for employment reference letter to be printed on letter head which I provided in first week of Mar. I didnt hear back from CO.
1. How long does it took for you to get this grant post application submission? 2. Did you upload the PTE scores on immi account or shared directly with DIBP from the pearsons website.? You need to upload the PTE result as well as share it directly from PTE to DIBP too. 1. I submitted all the required documents at the time of Visa application itself – Proof of Employment, Medicals, PCC – so it took just 55 days to get a direct grant – pretty surprising in my case. 2. Just as Anil mentioned, I shared directly with DIBP from my Pearson account. I came to Australia in Feb, 2016 and all my previous visas so far like student visa and temporary graduate visa are linked to my previous passport. In between these 3 years, I have been to india in Feb, 2018 and came back in march, 2018 holding my previous passport. and recently, I have renewed my passport in feb, 2019. Later on, so far I did my degree assessment and EOI based on new passport and few days back applied for visa 189, where I have filled all my forms in regards to the details on new passport but didn’t receive any Bridging visa A, as I was expecting it very next day. Now I have emailed immigration regarding it, but they told me that you were off shore while you applied for this 189 visa but I was present in Australia. what is the best possible possible solution to handle this problem? Will it affect my application for visa 189? I have filled all the forms like form 80 showing that I am in Australia, but in their records it shows that I am outside Australia, so how this will impact my application? If I will receive Bridging visa A, will everything be sorted? Will this all hustle impact on the processing time? I think the only gap is due to the renewed passport. If you can get a bridging visa, you should be good. My husband updated his EOI on the 20th Feb for Engineering technologist 233914. I do not have any estimate to share at this time. would you recommend to apply 189 and 190 separately? (i mean two different EOIs) or it doesn’t matter whether together or not.